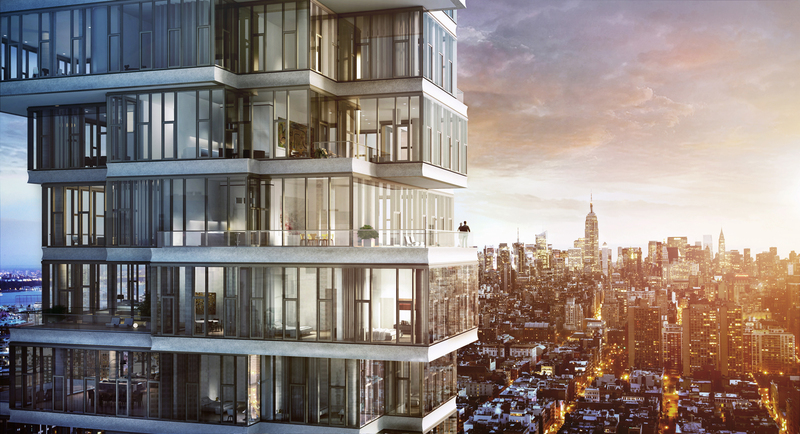 Designed by the Pritzker Prize-winning Swiss firm Herzog & de Meuron, the tower at 56 Leonard stands apart in several ways from the other projects in the exhibition. Its downtown location at the edge of chic Tribeca, a largely residential neighborhood in an area of converted late-19th century commercial structures, allows it to rise high above surrounding rooftops. Sited just outside the landmark district, and using air rights purchased from the adjacent New York Law School, when topped out in 2014, the tower will stretch to nearly 800 feet and 60 stories. The unusual staggered silhouette, especially of the upper floors, that earned the nickname "the jenga building" after the game of stacking and balancing wood blocks, also sets the form apart from the towers of the two other Pritzker laureates, Portzamparc, with the the patterned window walls of One57, or the structural expression of the steel frame in Jean Nouvel's MoMA Tower. 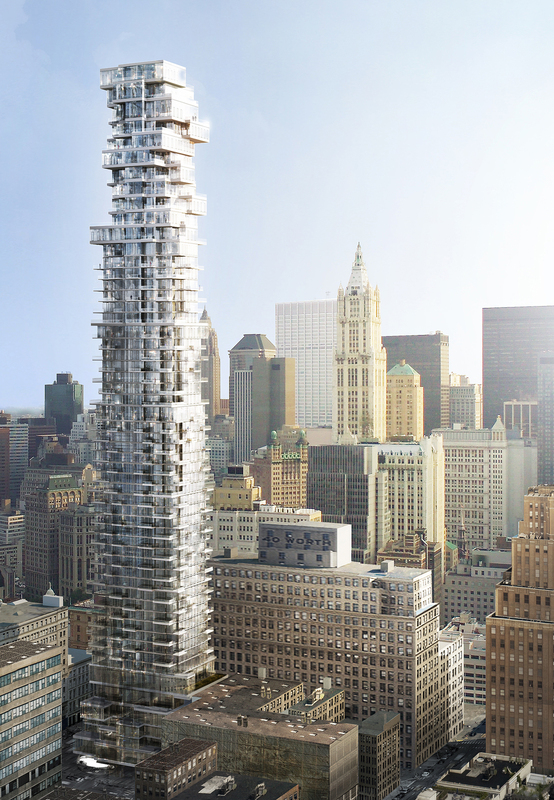 Herzog & de Meuron evoke a Modernist metaphor of "villas in the sky" by vertically stacking glass-house unit upon unit. The effect is most dramatic on the top eleven stories where the floor slabs cantilever as much as 25 feet and floor-to-ceiling glass and outdoor balconies create a sense of endless space. Below these penthouses, though, there is still insistent variety: the developer claims that each of the 145 units has a unique floor plan. Since skyscrapers are normally repetitive structures in the vertical dimension, the desire to create all unique units required innovative structural engineering approaches. According to the building's engineers WSP Cantor Seinuk, the structure of stacked, cast-in-place concrete flat plate floors is supported by reinforced concrete columns and shear walls. The central concrete core is supplemented by two sets of outrigger walls and a belt wall connecting the exterior columns to the building's core. The shear walls and columns employ high strength concrete of 12,000 psi at lower levels, reduced to 7,000 psi at higher levels. In addition they note: "In order to accommodate varying apartment layouts, virtually all the columns had to be relocated at various using a "walking columns" system-a solution created by introducing one to three-story walls that transfer the load from one column location above to a different column location below. The eccentricity of the transferred load causes an additional lateral force, which is applied to the structure at the top and bottom of the transfer wall. These additional lateral forces are then transferred to the shear wall core through the floor slabs." Conceived and marketed by the developers as individual artworks, rather than as regular apartments, the condos of 56 Leonard have enjoyed successful sales ever since the project, first designed before the recession of 2008, began construction in 2012. The cache and high value of the Tribeca neighborhood and the developer's commitment to high-profile designers, including commissioned sidewalk piece by the artist Anish Kapoor, has produced unusually high prices for downtown real estate, including a penthouse in contract for a reported $47 million. Video: Tronic Studio. Courtesy of Alexico Group. G.F.A. : 480,364 sq. ft. | 146,414 sq. m.